Fifteen World Class Drum Corps International units will come together later this month in Gadsden, Ala. to compete while raising funds to assist an Alabama community still reeling in the wake of a catastrophic storm earlier this year. On April 27, a massive tornado tore through Phil Campbell, Ala., a small town in the northwest corner of the state. Destroying hundreds of homes and taking 26 lives, the path of destruction included the town's only high school. One of the hardest-hit areas at Phil Campbell High School was the band room, where the music department lost nearly all of its equipment when the tornado severely damaged the building. 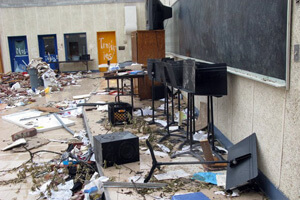 Without the insurance coverage needed to provide for the replacement of all of the instruments, students immediately pulled together, recovering 1,000 bricks from the devastated band room and instituting the "One Brick at a Time" fundraising campaign to restore Phil Campbell High School's music program. In the wake of the disaster and with the school's "One Brick at a Time" campaign well underway, 15 Drum Corps International corps are stepping up to make a difference in the lives of the students of Phil Campbell, donating a portion of their performance fees from the DCI Tour event in Gadsden, Ala. on Thursday, July 28. "We are simply overwhelmed by the response from the drum corps community," said Bobby Patrick, director of bands at Phil Campbell High School, and a 1988 member of the Florida Wave Drum and Bugle Corps. "The drum corps family is a family like no other. There are folks I marched with more than 20 years ago that are still in touch all the time, and the bond we share is still just as strong today as it was then. "With my daughter aging out this year with the Phantom Regiment color guard, I know how tight money can be for a corps on the road. The fact that the corps are willing to give up part of their performance fees to help our band is really incredible and appreciated more than we can even say." 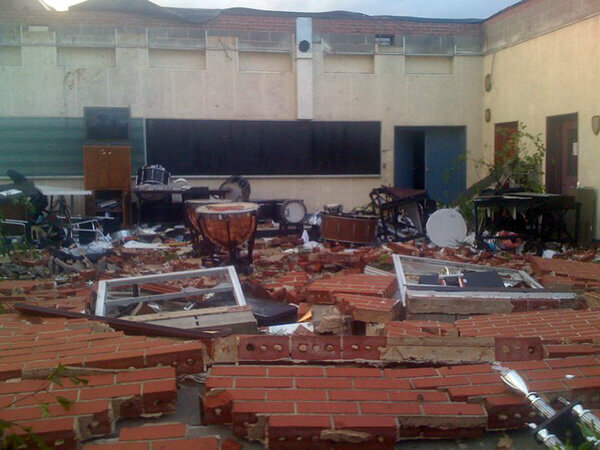 Phil Campbell High School's band room after the tornado. The DCI Gadsden event will take place at Titan Stadium at Gadsden City High School, located about two and a half hours east of Phil Campbell. "As I have told our band students for many years… 'Band is a family,' we spend more time with each other in school and in practice hours than many families spend together at home," said Gadsden City Band Director Steve Reagan, host of the DCI Tour event. "When a disaster of this magnitude happens, this is when a family must pull together. The competition is on the field. Off the field it becomes a common bond of music and personal friendships." Along with the $5,000 contribution from the 15 DCI corps, Drum Corps International will be donating $5 from the sale of each ticket to the Gadsden event to the restoration fund. "When we learned of the tragedy in Phil Campbell, we realized that we might be able to provide some assistance," said Dan Acheson, Executive Director of Drum Corps International. "The directors of the participating corps did not hesitate to offer up a portion of their performance fees in support of the Phil Campbell band, and our partners at Alabama Battle of the Brass were very gracious in jumping at the chance to extend a helping hand to their cross-state friends. We're sincerely interested in helping the Phil Campbell program get back on its feet, and our corps are committed to putting on a great show for thousands of enthusiastic fans from throughout the region on July 28." Learn more about the One Brick at a Time campaign on Facebook. Buy a ticket to the DCI Tour event in Gadsden on Thursday, July 28.